myBeepBeep Blog: New shops being added everyday! We have been adding shops to the Oil Change app everyday and I want to thank Keith Shaulis at City-Garage in the Dallas/Fort Worth are for signing 16 shops up and Keith Dubious from Victory Lane Quick Lube in Pine Bush, NY. These two are real professionals and "get it" that the new way of connecting with customers is through smart phone technology and the myBeepBeep Oil Change app. 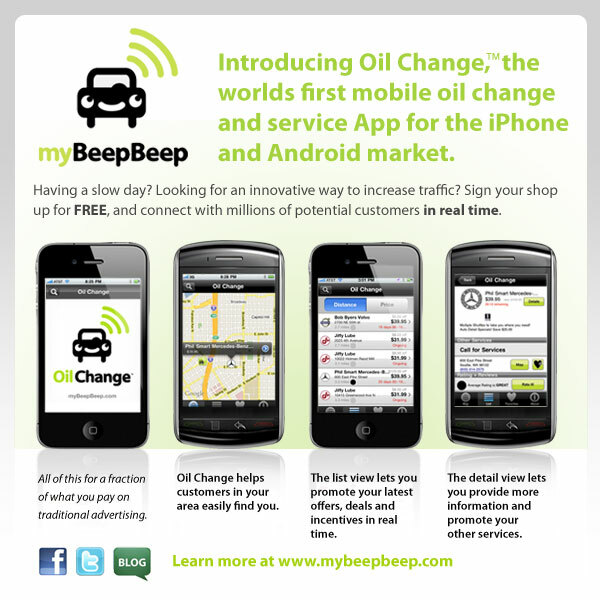 Follow this link to Oil Change on the iTunes Store http://itunes.apple.com/us/app/oil-change/id359191406?mt=8 to view the apps features and description. Go get your car serviced by these great companies! We are speaking with shops in all areas across the country with tremendous response so please stay tuned.